Acknowledged as the UK's foremost musical pioneers, with an extraordinary recording legacy, the Philharmonia leads the field for its quality of playing. Together with its relationships with the most sought-after artists, most importantly its Principal Conductor and Artistic Advisor Esa-Pekka Salonen, the Philharmonia Orchestra is at the heart of British musical life. Esa-Pekka Salonen made his London conducting debut with the Philharmonia Orchestra in September 1983 and he has returned to conduct the Orchestra on a regular basis ever since. 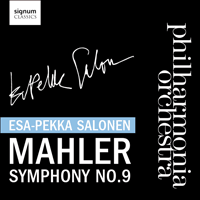 This is the third in our series of Philharmonia releases that feature Salonen as conductor following Schoenberg's Gurrelieder and Berlioz's Symphonie fantastique. In 1907, after more than a decade as Director of the Vienna Court Opera, Mahler accepted a post at the Metropolitan Opera in New York. For the remaining four years of his life, he spent six months in New York (October to March) and six months in Austria (April to September), where he continued to spend the summer months in his beloved mountain landscapes. Das Lied von der Erde, the Eighth, Ninth and unfinished Tenth symphonies were all written in a small forest hut in the Dolomites (then part of Austria, now in Italy). The tension Mahler endured all his life, between a hectic conducting season in the city and the solitude of his summer composing retreats, must have felt even more pronounced in these last years. Returning to the idyllic peace of the mountains, after long transatlantic crossings and the foreignness of his American life (he spoke very little English), must have been marked by an overwhelming sense of homecoming. Such a feeling is evident in both Das Lied von der Erde and the Ninth Symphony. Berg went on to say that the whole first movement ‘is based on a premonition of death’. This is quite literally written into the form of the piece, which alternates constantly between wistfully lyrical sections in D major, and a kind of negative version in D minor. With each successive return, the distance between these musical worlds seems to increase, as the music plunges from heroic striving, on the brink of some rapturous breakthrough, to moments of complete collapse into a shadowy, empty landscape (Mahler’s marking is Schattenhaft). Faced with no hope of reconciling such an opposition, the end of the movement is shaped by quiet withdrawal and dream-like reminiscence. Mahler marks the final page of the score ‘lingering’; in the sketches, he wrote simply ‘Leb’wohl!’ (Farewell!). The second movement alternates four contrasting Austrian dances—two Ländler (country dances) and two waltzes. The first Ländler is marked ‘somewhat clumsy and very crude’, its raw quality underlined by the bad behaviour of the horns and the instruction to the violinists to play ‘like fiddlers’. This is a country dance in heavy, muddy boots, done with great affection even as it gently falls apart into loquacious repetitions. The rustic cartoon is interrupted by a mad waltz that spirals out of control, changing key with a sense of drunken abandon. A second waltz, given in the low brass, sounds like a military band has invaded the orchestra, before a second, slower Ländler, evokes a wistfully sentimental recollection of the countryside. Mahler’s modernity here lies not so much in his materials (bewilderingly familiar to his first listeners) but in the way that he foregrounds the lack of fit between them as the music lurches from the frivolous to the grotesque, the sentimental to the modern. At the end of the movement, Mahler allows his orchestra to fall apart like a machine shedding its parts one by one. The music breaks into fragments, scattered around the orchestra, until the whole thing simply runs out of steam. In the third movement, the sense of distortion and exaggeration is greatly magnified. Mahler’s Rondo-Burleske presents a highly energetic and contrapuntal music, but one that struggles to contain its plural voices, all tugging in different directions at once. Just as it seems ready to implode under its own weight, this unrelentingly strict style gives way to a lightweight music that sounds like operetta (some critics heard echoes of Lehár’s The Merry Widow!). The recurrent interruption of one element by the other is eventually broken by an astonishingly self-conscious act of authorial intrusion. Mahler ‘rips up’ the music heard thus far, like a film-director suddenly intercutting a completely different scene. A series of glissandi in the harp introduce a disjointed set of musical voices—some of them grotesque and distorted (the E flat clarinet) and others earnestly expressive (the solo trumpet). This whole passage, suspended out of normal symphonic time, functions like a set of dream visions of what might be, before we are plunged back into the movement’s opening material, which gathers ferocious force all the way to the end. The Adagio Finale stands in absolute and complete contrast to the previous two movements. Where they delivered a succession of ironic voices, thrown around the orchestra in a mad whirl, the Adagio presents one of Mahler’s most intense statements of an authentic lyrical voice. It is signalled in its solemn and hymn-like gait, but above all in the intensity of tone that he wrings from the close scoring of the strings. Here, too, progress is defined by the alternation of two different types of music—the richly scored, passionate and almost painfully beautiful opening, and a passage of bare, two-part music, shocking for its apparent emptiness and marked to be played ‘without emotion’. The more bare the latter becomes, the more intensely the other is affirmed: if the Ninth is indeed a farewell, it does not ‘go gentle into that good night’. Nobody who feels this music intensely would be so crass as to attempt to say ‘what it is’ that Mahler’s music sings about. What lingers long after the resonance of the last fragile notes have died away into silence, is that he did—that such a passionate singing was voiced. As all three preceding movements have done, the Finale also ends by means of a gradual process of fragmentation, but whereas the middle movements break down or fall apart, the Finale gently dissolves; its constituent lines, no longer held together, evaporate one by one. The final Adagissimo must be the longest last page in music history, as the remaining fragments of melodic lines, receding into the distance, are gradually reclaimed by an incoming tide of silence.